I have sent the forms for Confirmation home again so that you can discuss with your child further about their chosen Confirmation name and Sponsors. We have discussed this further and you may want to change their chosen name to a more suitable name or pick a Sponsor according to the criteria below. There has been a long tradition of selecting a saint’s name for Confirmation. This tradition is optional. You may like to keep you own baptismal name if it is one from the scriptures or of a saint and that it has special meaning to them that saint. If you choose to have a specific Confirmation name, your decision should not be made “on a whim.” The name you choose should be based of knowledge of a Saint or person from Scripture. This person’s life should have special meaning to you, and should serve as a great example for your own life. Choosing a Confirmation Sponsor is an important first step in preparing for the Sacrament of Confirmation. 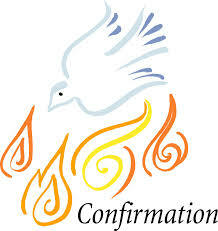 Each confirmation candidate must have a sponsor to represent the support and faith of the community. The sponsor is a vital part who gives witness to faith that is alive through his or her example of prayer, ministry and honest sharing. The candidate and their sponsor should spend a lot of time together talking, reflecting on scripture, and praying. Your sponsor must have been confirmed in the Catholic Church. Your sponsor must be an active, participating member of a Catholic parish at this time. If you are having an issue with this please come and see Mr Norman and we can discuss a suitable option. Below are some questions you may like to ask your sponsor. Here are some questions that you might ask people that you are considering for being your sponsor to find out more about their faith. 1. Have you always been a Catholic? Has your faith always been an important part of your life or did you come to a deeper appreciation of your faith that helped you to grow closer to God? Who or what has influenced you to grow closer to God? 2. How do you practice your faith? Attend Sunday Mass weekly? Daily Mass? Holy hours? Adoration? Confession? Other prayer times? 3. When do you pray? What prayers do you prefer? 4. What is your favorite part of Holy Mass? 5. Do you have a favorite saint or devotion? The Sacred Heart? The Blessed Mother? 6. Do you have any particular childhood memories of the faith or of your experiences in worshipping God? Did your family have any special traditions tied to the faith? 7. Have you ever had to defend the faith? The Church? When? How? 8. Are you active in your Church? How? What do you find rewarding and why? 9. Do you do community service? What? How do you feel about helping others? 10. Who is your Confirmation Saint? Why did you choose that Saint? 11. How have the Gifts of the Holy Spirit made a difference in your life? 12. Has there ever been a time in your life when your faith made a big difference in your life? In the lives of others? 13. Do you see the hand of God working in your life? In my life? 14. Do you have any advice for me as I prepare for Confirmation? For witnessing to my faith as an adult Catholic?